Diabetes is on the rise in American children and teens. Recent studies from University of Colorado School of Public Health have uncovered a disturbing link between Type 2 diabetes in kids and the risk of early kidney damage. Our infographic below highlights the facts uncovered by the studies. If you like our post, please support us with a tax-deductible donation. Every amount helps. Just click the Donate Now button at the upper right of this page. Let’s wipe out kidney disease together! 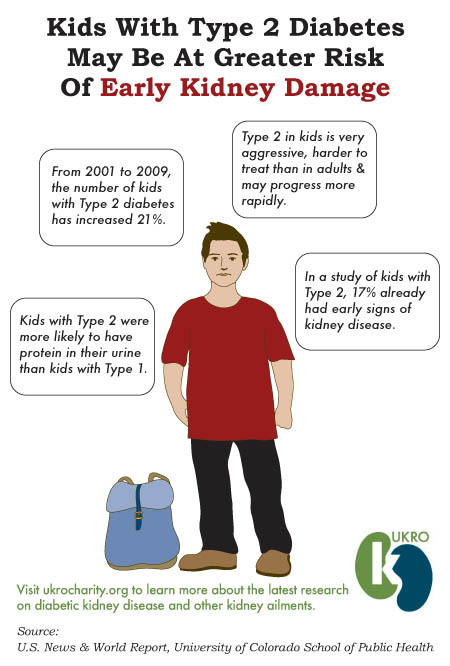 children, diabetes, diabetic nephropathy, infographic. Bookmark.